Instead, organisers CCP intend to take Fanfest on the road throughout the year, with one stop taking place in an EVE player’s home. Fans will be invited to submit a video to convince CCP to hold Fanfest in their living room, with all the regular scheduled events associated with Fanfest taking place in and around the player’s home. That includes a keynote from senior CCP staff from a capsuleer’s couch, demos, roundtables, cosplay, the CCP Games Games, the infamous pubcrawl and the final night party with CCP’s rowdy house band Permaband. 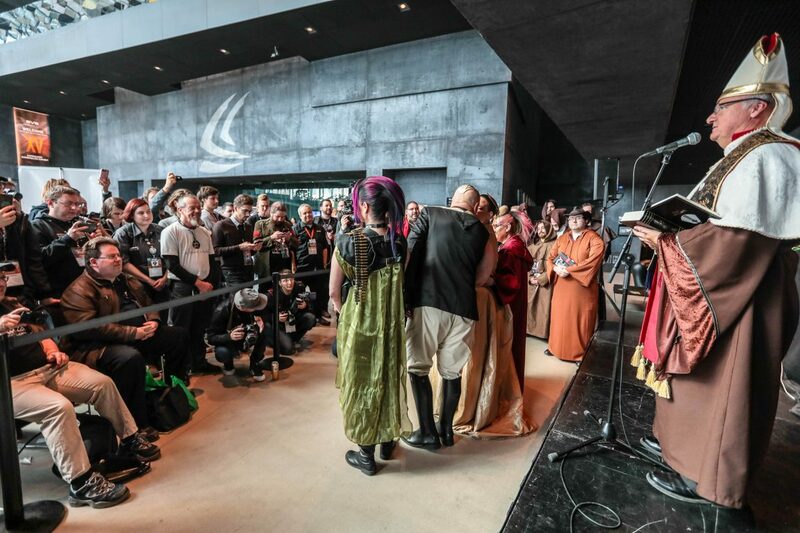 This year’s Fanfest also inlcuded a dunk tank and the first EVE wedding, overseen by the space pope. Just in case you were wondering what you’re letting yourself in for. Details of the competition will be finalised soon, according to CCP. Although there’s no plan for an event in Iceland, other fanfests and meet-ups are planned in Vegas, Australia, Europe and possibly the east coast of the US. EVE Fanfest came to a close on Saturday, after CCP had revealed details of a new expansion set for release in May, Into the Abyss, where players will engage in PvE missions to gather highly valuable resources allowing them to build their own Triglavian ships. You can read our full interview with CCP boss Hilmar Veigar Pétursson about the future of CCP, EVE Online and new shooter Project Nova here.